NetHack is a single-player roguelike game. The player has to find the Amulet of Yendor at the lowest level of the dungeon to win the game. 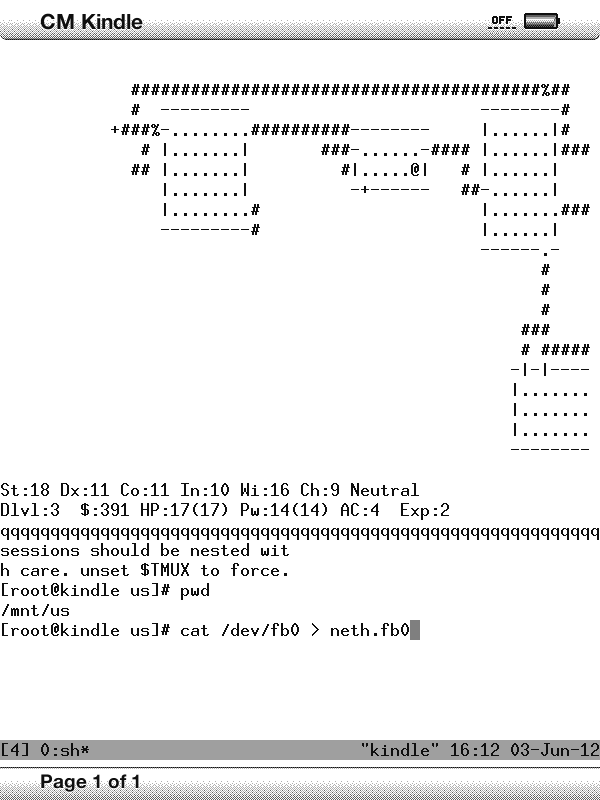 Download the NetHack binary package and extract the contents. The NetHack control.tar.gz contains a file named postinst which is a script to be run after the binary files are installed. The NetHack data.tar.gz extracts to the paths below under the /opt dir. Copy the extracted bin and share folders under the Kindle drive "local" folder. Copy the postinst to Kindle drive. The postinst script assumes the nethackdir to be in /opt/share/nethackdir . There is some error at the end that can be ignored. Just type nethack (and hit ) to run the game. Cannot lock perm for unknown reason (1). The error has to do with locking the perm file in nethackdir has failed. This is probably related to the vfat file system the perm file is residing in. The locking operation is probably not supported in vfat file system. As can be seen from the mount command output, /dev/mmcblk0p2 partition uses ext3 file system and it is mounted at /var/local and is also writable by default. I should be able to copy all the files and subfolders in nethackdir to /var/local/.nethack and then use .nethack as the nethackdir. But, I choose to create symlinks in .nethack to point them to their original location in /mnt/us/local/share/nethackdir for all the files and subfolders. As Duokan contains Python 2.6 binary in DK_System\xKindle\python, I just create a symlink in /usr/bin to link to it. Because the perm file is already placed in /var/local/.nethack previously, the python script will not create a symlink for it. So, essentially, the perm file is in the ext3 file system, and the rest of nethack files are in the Kindle drive vfat file system. Also, I downloaded the Gnugo package. For gnugo, only gnugo (under /opt/bin) needs to be copied to Kindle drive local/bin.